GEOTRACES represents an unprecedented integration and synthesis on a global scale of research on the marine biogeochemical cycles of trace elements and isotopes. As such, GEOTRACES requires strong coordination and management. An overview of the organisational structure of the GEOTRACES Programme is presented below. The Scientific Steering Committee (SSC) has the primary responsibility for coordination and management of international GEOTRACES activities. The SSC oversees the International Project Office (IPO), the GEOTRACES Data Assembly Centre (GDAC), the Standards and Intercalibration Subcommittee and the Data Management Subcommittee to ensure that the common needs of GEOTRACES activities are met. The SSC interacts with national committees and organises planning workshops as needed to establish research priorities and implement GEOTRACES. Of particular importance for GEOTRACES is the need to organise ocean sections, both to ensure global coverage of vital regions of interest and to avoid unnecessary duplication of effort. The SSC reviews national proposals for sections and offer recommendations for adjustments to proposed sections when these are deemed beneficial. In addition, the SSC fosters partnerships where international collaboration is needed to complete a section, or to ensure that all core parameters are measured along a section. The SSC seeks financial resources from national and international funding agencies to support the implementation of GEOTRACES. The International Programme Office (IPO) serves as a co-ordination centre for day-to-day operations and logistical matters. It is hosted at Laboratoire d'Etudes en Géophysique et Océanographie Spatiales (Toulouse, France). The IPO assists the SSC and its standing committees with all aspects of their work. 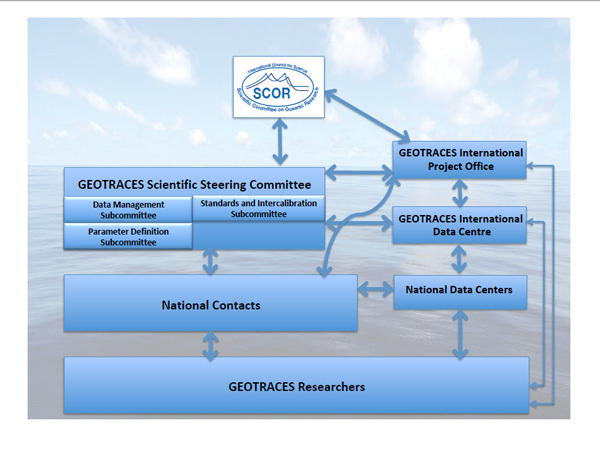 The IPO facilitates communications among the various components of GEOTRACES (e.g., national committees, standing committees) and serves as the primary interface for communications with the broader oceanographic community and with the general public. The GEOTRACES Data Assembly Centre (GDAC) has as main aim to integrate core GEOTRACES data into a global data set. It is responsible for the compilation, quality control and secure archiving of data received from national data centers and from core international GEOTRACES cruises. The GDAC is in charge of creating global Trace Elements and Isotopes (TEI) datasets and make them easily accessible to participating scientists and the larger science community according to the GEOTRACES data policy. The GDAC is hosted at the British Oceanographic Data Centre (Liverpool, UK). The GEOTRACES Data Management Subcommittee is established to recommend to the SSC standards and formats for submission of data and metadata; recommend to the SSC data policies; and oversee the activities of the GDAC. The Standards and Intercalibration Subcommittee oversees GEOTRACES Intercalibration activities with the overall goal of achieving the most precise, accurate and intercomparable data for the suite of GEOTRACES TEI data sets. The Parameter Definition Subcommittee has as mission the definition of the names of the GEOTRACES parameters which following the GEOTRACES naming conventions. See the Terms of Reference for GEOTRACES Scientific Steering Committe and Standing Committees for further information.